He has nominated both Herman Cain and Stephen Moore to the Federal Reserve board. Both of them strongly support the gold standard. Yet both of President Donald Trump’s apparent picks for open seats on the Federal Reserve Board of Governors, Stephen Moore and Herman Cain, are interested in fixing the price of the dollar in quantities of gold—bringing back a system that President Richard Nixon abandoned in 1971. Their stance on gold encapsulates how far the two are outside the mainstream. It doesn’t mean they’re wrong—just that most economists of the left, right, and center who have looked into restoring the gold standard have concluded that it would be a bad idea. 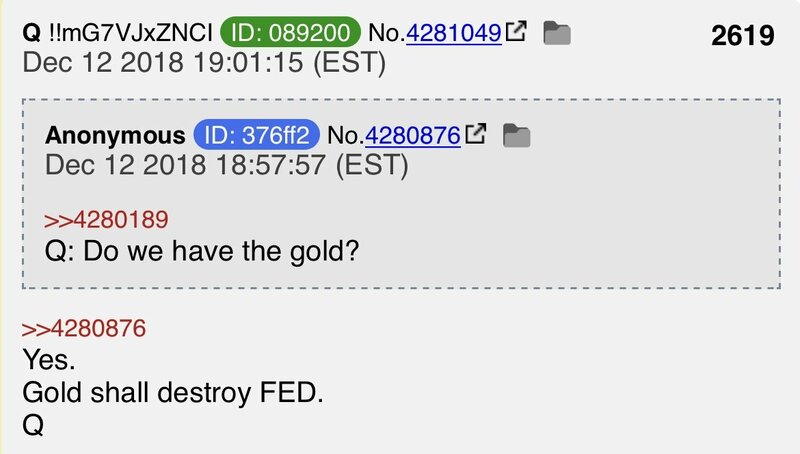 Q said back in 2018 that gold shall end the fed. It's coming. "Countries are benefited when they changed these [national sovereignty] policies, and evidence suggests that North Americans are ready for a new relationship that renders this old definition of sovereignty obsolete." The Fed cannot create a gold standard- only Congress can (with the signature of the President on the legislation). He wants Cain to make more free money and return to zero interest rates. I think krugman , Q etc are both pretty far off the mark . I would love to see the Fed go .It would be nice to back a dollar with something . Dollars are not worth enough to need gold but if you did there would not be enough gold . Probably more like how many bottlecaps to the dollar . That would still make it more valuable than other currencies since everyone has made the mistake of not having the first backed currency which would immediately become the world preferred currency and it is all worthless paper too . You think the $#@!ty house of representatives will do anything to make wasting money on stupid $#@! harder ? I predict not . Last edited by oyarde; 04-07-2019 at 03:55 PM. I do think getting rid of people off the Fed board is a good idea . You cannot just peg gold at 1400.00 an ounce or whatever , because nobody else will . M2 money supply is $14.5 trillion. Gold would have to be $61,000 an ounce instead of $1300. M2 money supply is $14.5 trillion. Yep , too much paper . While I totally oppose the fed , while it is there it should at least have people on the board that meet the actual criteria . Gold standard may or may not not be feasible to return to until the total economic collapse . Both nominees have changed their positions on monetary policy. “He was a regular critic of the Fed’s unconventional policy easing and, as recently as 2014, advocated for a reversal of QE through $45bn in monthly sales of Treasury securities and MBS holdings that would have reduced the Fed’s securities holdings by 75% through 2020, ” Gapen wrote in a note. Trump too was against monetary easing before he was in favor of it. Last edited by Zippyjuan; 04-07-2019 at 04:28 PM. Q was three years behind the curve. Better late than never, I guess. I want to see the dollar's worth to increase to the point that a person could buy a carton of eggs, loaf of bread and, a lb of butter. with one dollar. Trump directly said that he wants QE4. All of this nonsense is a pipe dream. So has a Contenental become worth more than a dollar? The only way to suppress the price of something is to flood the market with the item and for a long time. Central banks don't have enough gold to do that. They hold about ten percent of the global supply. Everyone paying attention knows the market is flooded with gold. PAPER GOLD. Most of which is never redeemed for physical but does serve to drive down spot price. So you think Trump is an honest straight shooter? They're setting up the planned "show down" between Trump and the Fed over monetary policy. Read the linked thread in my first post above. Link to central banks selling paper gold? Chester Copperpot's understanding isn't exactly correct but he's got the gist. Not my job to defend his slightly inaccurate statement. Regardless, the BIS strictly restricts information about their gold operations and all of the owners of the central banks are the member banks of the various central bank systems. Do you want me to supply links to JPMorgan, for example, selling gold and silver contracts? Any separation between JPM and the Fed is merely words on paper. Bottom line is that spot prices are suppressed by paper contracts far in excess of available gold and silver that changes hands. Last edited by devil21; 04-08-2019 at 11:34 AM. Cain was chairman of the Federal Reserve Bank of Kansas City Omaha Branch from 1989 to 1991. He was deputy chairman, from 1992 to 1994, and then chairman until 1996, of the Federal Reserve Bank of Kansas City. JP Morgan is not a Central Bank. But why would the Fed care what the price of gold is? Last edited by Zippyjuan; 04-08-2019 at 11:38 AM. JP Morgan is not a Central Bank. No it is not but that's typical Zippy haggling over what the definition of the word "is" is so as to confuse the bigger point being made. Paper contracts issued by member banks that far exceed physical supply are how the spot prices are suppressed. It's documented, on record in court cases and widely known. Why would a central bank who does not have its money backed by gold care what the price of gold is? Why suppress it? "Gold up- it is the market! Gold down- it is manipulation by the Central Banks!" High gold prices reflect currency weakness. Duh. Keeping gold and silver looking "unattractive" and "unproductive" provides a mental support to the debt money printing game....until the same bankers decide to change the game. And they have decided to change it, hence why they're placing "gold bugs" into the Fed to act as mouthpieces for the desired changes. Ya always need new PR folks to sell policy changes, yes? But you already know all of that. Central banks do try to target prices- overall prices (inflation) but not the price of any single commodity. Is the Fed targeting any other commodities? Keeping their prices from soaring? If the Fed is manipulating gold and not others their prices should be soaring compared to gold. Why aren't they? What about silver, platinum, steel, aluminum, copper, zinc, sugar, wheat, beef? Are Central Banks playing in those markets too to hide inflation? Last edited by Zippyjuan; 04-08-2019 at 12:07 PM. Same paper contract games being played in all markets. Newsflash: there is no such thing as genuine price discovery allowed today and what little slips through is hidden in other ways, such as smaller weight of a bag of potato chips with a bag filled with air, copper wiring mixed with other more abundant metals, real sugar replaced mostly by HFCS in products, beef prices per lb rising quickly and selection shrinking, etc. The "less is more" narrative is all around us. Apparently you don't ever go shopping. Wow! The Fed even controls the size of your potato chip bags! Talk about a powerful organization!